Preserving our past, building our future! On Monday, March 9, 2009 the Mayor and Common Council honored the Historic Belle Grove Square Neighborhood Association with an official proclamation honoring our neighborhood. Members of our neighborhood gathered in our park on Thursday , March 12, 2009 for a presentation by city officials to explain which trees were being removed and where the new trees are to be planted. On April 1, 2009, to commemorate Arbor Day 2009, the City of Westminster Tree Commission and the neighbors of Belle Grove Square planted new cherry trees in the park. The City’s Mayor, Thomas Ferguson issued a proclamation and the work in the park helped satisfy the requirements for Westminsters Tree City USA City recertification for 2009. In addition to the plantings, the City Arborist, grounds maintenance crew, and Bartlett Tree Experts have performed nearly $10,000 worth of work removing hazardous trees and pruning the remaining. With this work, the park will continue to be an asset to the City and nearby neighborhoods for years to come. Our park benches have been repainted by the city of Westminster. The park benches are painted and repaired by city workers each spring. We very much appreciate the effort of the City of Westminster to continue to invest resources into maintaining one of Westminsters’ earliest green spaces. 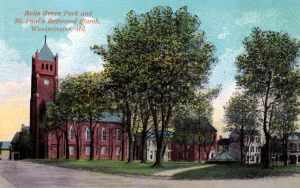 Belle Grove Park and St. Paul German Reformed Church are shown in this postcard from the 1920s. The fountain is shown in the middle of the square. On Thursday, July 23, 2009 Belle Grove Square residents met for our first annual picnic in the park. It quit raining just in time for what turned out to be a fantastic evening. About 50 residents joined their neighbors for good food and great conversation. Stay tuned for future events. In 2009 we finalized the design for our street toppers and are currently determining the cost to manufacture the signs. The street toppers will be placed on top of existing street signs at the entrances to our neighborhood. In 2009 our neighborhood was chosen by the city of Westminster to host the December 2010 Holiday Home Tour.